Toronto Pearson International Airport is about 14 miles (22.5km) from the city centre and takes around 30-50 minutes by car depending on traffic. Taxis are available from the terminals, costing around $55, or UP Express trains depart for the downtown Union Station every 15 minutes and cost from around $19.00 for a one way ticket, taking 25 minutes. 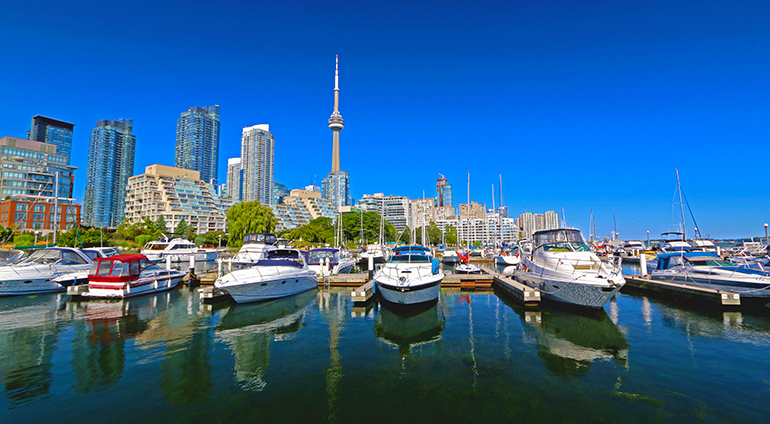 Once you arrive in the city centre Toronto is generally quite easy to navigate on foot or by public transport and you can buy individual tokens or day and week passes that cover the subway, buses and streetcars, run by the Toronto Transit Commission (TTC). You can also hail a cab in most downtown areas. While the taxis may differ in size and colour, they all show they are available with a light on the top and are charged according to the meter.